Don't look now! : Rainbow Lollipops! It's finally finished! I started this quilt along with 3 others, 4 weeks before Christmas with unrealistic plans to have them all completed for Christmas morning ... so this one is only 79 days late & the other 3, well who knows?. I like to piece the backing to add a bit of interest. I also added a rainbow on the label. I used O-sew-soft as the batting for the first time in this quilt. I found that it bearded a little or really it was more like pilling that you get on clothing, which I haven't experienced before with other battings. I have already sandwiched the other 3 tops using this batting. After this I don't think I will use it again unless I find it's performance improves. Mind you no one else would notice it other than me! So what next? Something for Easter for my little bunnies, then I plan to complete the machine quilting on Joshua's Christmas quilt so that he can finally ditch his cot quilt. I'm also looking forward to giving the Fabumotion a good work out. I used it a little on the finishing touches of 'Rainbow Lollipops' and I think with a little practice it will be fantastic to work with. We have a kinder BBQ & a festival to entertain us this weekend ... providing my sweet Joshua can stop vomiting ... this heat is not such a good choice of time to get sick! That quilt is just so gorgeous, the colours are just so pretty. Was the actual quilting done by machine? I could never do anything like this. Lucky girl, clever mammy. WOW!! It's absolutely stunning and so very pretty! 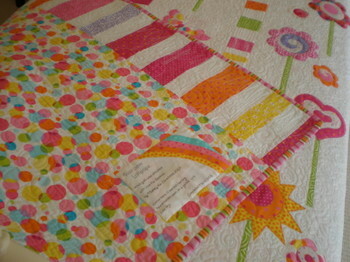 I love the rainbow and love a pieced back. I started a quilt for my 5yr old Lucinda yesterday - needed something to sew at the show! I'm using similar colours but doing applique dresses. She thinks it's fab! I would say that it was well worth the 79 day wait! It is just lovely - well done. Jessica's quilt is amazing! Was it your own design? 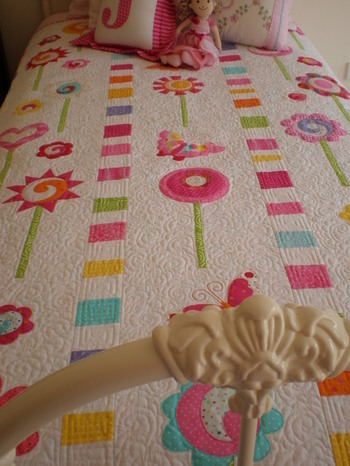 I love the pretty fabric you have chosen and it looks gorgeous on that beautiful iron bed - a little girls dream bedroom. I will have to check out the fabumotion. My attempts at machine quilting have been less than successful so I usually resort to hand quilting which takes so long. That quilt is just beautiful! Is the Fabumotion a frame of some sort? What a talented lady you are. I popped over from Tracey Petersen's. Kellie, that quilt is sensational. How beautiful. did you quilt it yourself? The colours are just beautiful. A little girls dream bedroom. By the way, Jessie, I didn't get to hold the rabbits, maybe I could sneak in a hold today. 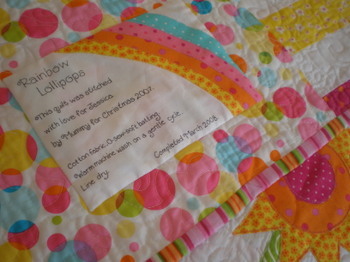 The quilt is simply stunning - well and truly worthy of being a blog banner too! How did you do the swirls in the lollipops? Was the quilt your own design? By the way, you big fibber, I don't see any black on this quilt. That is just breathtaking. It looks so perfect and neat - the colours are beautiful. HOw talented you are and how lucky your little girl is! Your quilt is just GORGEOUS!!!!!! Beautiful quilts and gorgeous kiddos! I was so excited to get your comment on my page this morning! I just started my blog and really have no idea how one sneaks in to this bloggy/crafty scene I've discovered. Haha sorry that everything is in Spanish on my page, Im living in Chile right now so my computer just assumes that I want everything in Spanish, I keep trying to change the language and it just changes back, damned arrogant thing! Well Cheers to you, and congrats on the incredible blankies! ..... My love-hate relationship with my first quilt should be ending soon! I can't wait! Found your blog today thru Peppermint Patcher...I love your work! Can't remember now how I found your blog but just wanted to say it is fabulous. Quilts are stunning!!! the quilt is absolutely gorgeous!!!! Wow!!! I agree the quilt is darling. 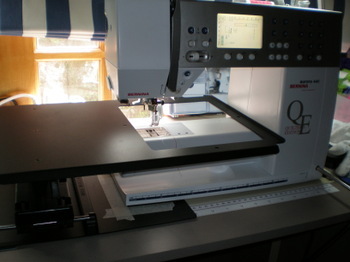 I haven't been interested in quilting for awhile but after see your quilt I'm thinking of trying it again. Is the pattern for sale. It's simply adorable, the colors are perfect. I'm back - again and again. I hope you don't mind! I simply just can't stay away! :) I am in love with Jessica's quilt! Lucky girl!